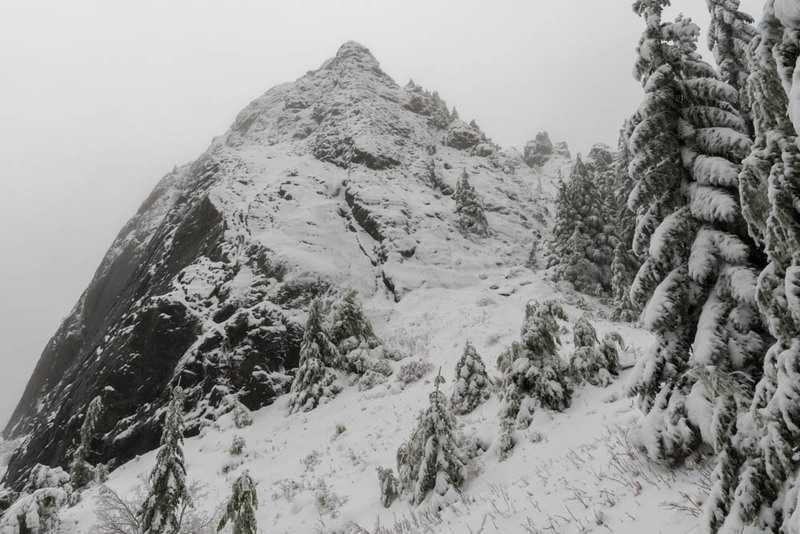 The ‘haystack’ summit of Mount Si. I was in Seattle for a visit to the University of Washington, and decided to extend the trip for a day so I could take advantage of the wonderful hiking opportunities nearby. Overwhelmed by the number and variety of hikes in range of Seattle, I settled on a classic choice: Mount Si. According to the statistics on that site, I was probably the 99,999th person to hike the trail this year. Still, on a drizzly Friday in the off season, I figured it couldn’t be too crowded. I left Seattle before sunrise, drove through a light drizzle (which, I gather, is the norm for Seattle) and reached the trailhead around 8am. With 3,100′ of gain in four miles, this is no little walk in the woods – but it’s actually comparable to my benchmark, the Glencliff trail on Mount Moosilauke. In fact, Mount Si barely tops 4,000′, shorter than Moosilauke. An eery rainforest of moss and epiphytes covers the lower elevations. In the mist and drizzle, the low-elevation forest was was verdant. 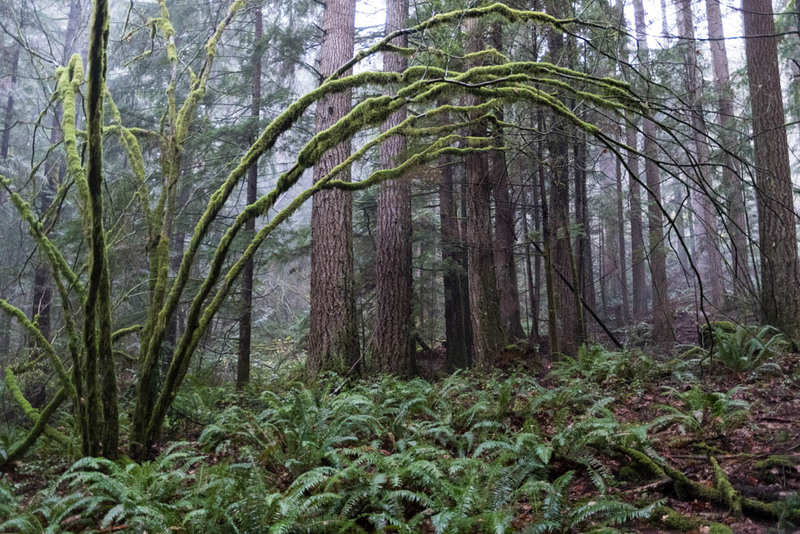 Moss and epiphytes covered every branch, and trapped the mist so it could drip on me as I made my way up the trail. The trail is well-built and well-maintained, generally steady going. Numerous switchbacks meant the trail was never very steep. The air cooled as I climbed and I finally started seeing patches of fresh (though wet) snow at around 3,800′. I popped out into a clearing, where a large black Raven awaited me. Clearly he had been there earlier, when today’s three early hikers paused to snack and turn around, and he was hopeful that I brought more goodies. 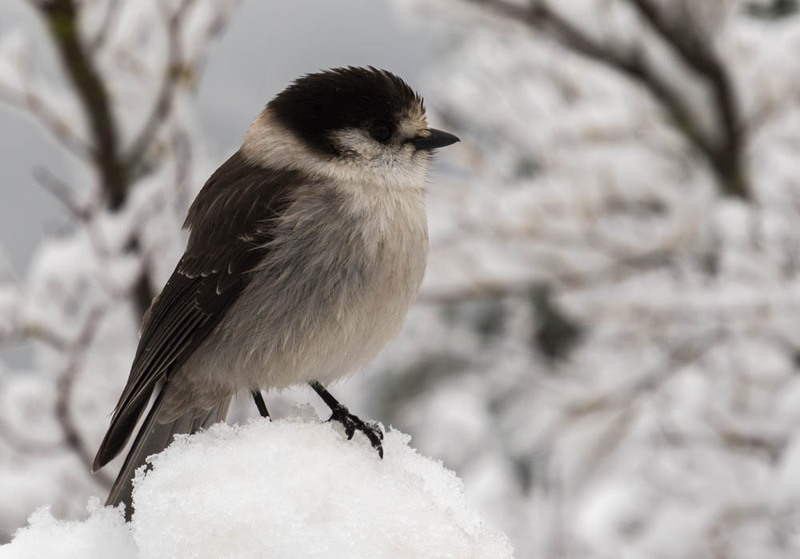 Gray Jays are an ever-present companion at snack stops at higher elevation. Four or five Gray Jays quickly detected my presence and snuggled together on snow-covered branches, ready at a moment’s notice for a dropped raisin or bagel crumb. Here there was consistent snow cover, just an inch or two, and rather slushy. In the clouds now, the viewpoint offered me nothing – but at least the precipitation stopped. I pressed on, up and over a rocky outcrop, toward the true summit – a sheer cap called the “haystack” (shown above). 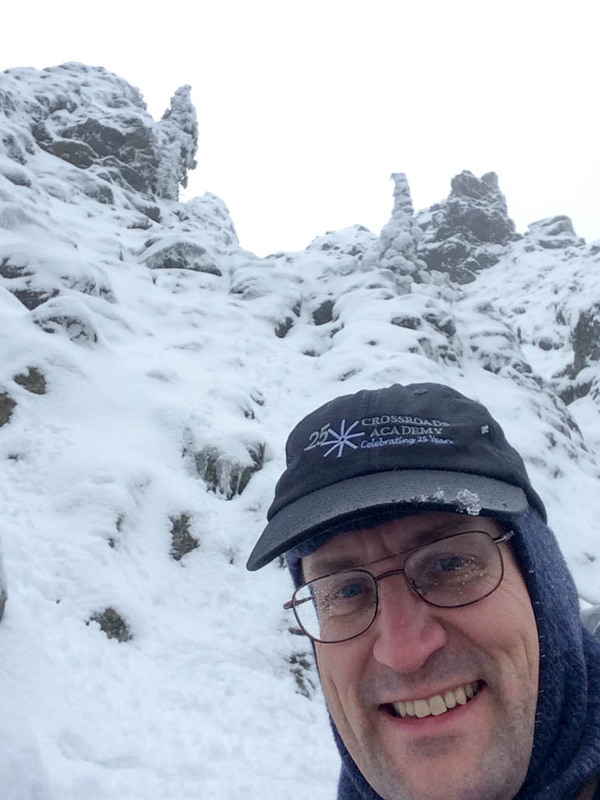 Remarkably, though I climbed only another hundred feet, the snow became deeper and more firm, as much as 6-18″ deep in the sheltered spots. The snow line from recent weather must have been close to this elevation. I turn back from the near-vertical gully filled with snow and ice, and lots of exposure. I followed old tracks, covered in this morning’s snow, around the base of the Haystack. The footsteps disappeared at the base of a steep gully, where tiny avalanches caused golf-balls of snow to roll down toward me. Gosh, this gully is steep, and extremely exposed. I picked a line and tentatively began to climb, but thought better of it after a dozen yards. I retreated and picked another line. Going upward was easy, kicking steps in the wet snowpack. About halfway up, though, I reconsidered the exposure. A slip here would mean a long slide down the gully, ricocheting off the boulders. Hiking solo, and with few other hikers visiting the Haystack today, I decided it’d be best left for another day. The trip down was a cruise, back and forth on the switchbacks. I quickly left winter behind, and emerged again into a verdant rain forest, pausing often to attempt to capture this magical place in photographs. I can see why this mountain is so popular, and really need to return when the sky is clear. Check out the full photo album.